Magna International (MGA) is a global auto parts supplier. The stock was flirting with $100 last year, but due to the collapse of the auto industry it now trades at just $26. It has a debt to equity of just 8% and produces a diversified plethora of parts in plants across the world. Does this stock represent a great value opportunity for long-term investors who expect auto sales to return in the long run? The chart above clearly demonstrates the high risk nature of this company. The loss of any of these major customers reduces the value of this company tremendously. Also note that the auto parts industry is characterized by high fixed costs, and therefore any changes in revenue have a magnified effect on the bottom line. 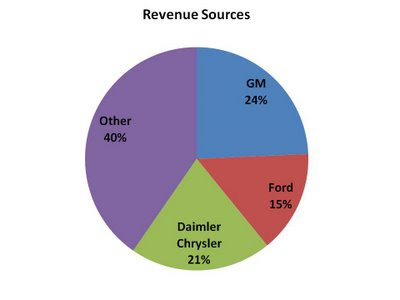 In other words, while the loss of GM as a customer (to bankruptcy or to a competitor for example) would reduce revenues by 24%, it would reduce earnings by even more. For a recent example we've discussed of a beaten-up auto industry stock that offers value without the concentration of customers, click here.